Talking to aging parents about money, retirement and estate planning is a challenge for even the most open families. In their latest Intra-Family Generational Finance Study, Fidelity Investments found aging parents and their adult children are often at odds over when and how to discuss finances. While parents and their adult children agree discussions need to take place, a majority of them (64 percent) don’t agree on when that should happen. Most parents want to wait until after retirement to begin talking about finances, while their adult children overwhelmingly want to begin those discussions earlier. When estimating the value of their parents’ estate, adult children underestimate the amount by more than $300,000 on average. 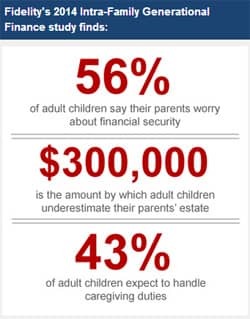 Adult children believe their parents worry about finances far more than they actually do. A total of 23 percent of parents admitted to being concerned, while 56 percent of adult children believed their parents were concerned. 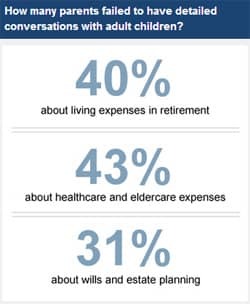 When it comes to talking with family about retirement living expenses, 40 percent of parents said they have not had detailed discussions and 15 percent have not had any discussions at all. Forty-three percent of parents have not had detailed discussions involving long-term health care expenses and 20 percent have had no discussions at all with their adult children. While the results of the study may not be surprising given the sensitivity of the subject, all agree the conversations are important to have. Begin talking about finances earlier rather than later. Adult children should find ways to ease into financial discussions with parents and be persistent. Adult children must recognize who ultimately makes the financial decisions. Parents, whose finances and retirement it is, should be the decision-makers, as long as they are of sound mind. 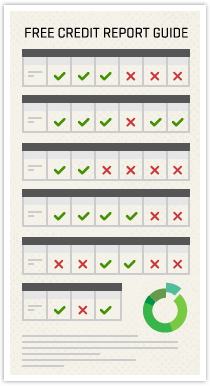 Consistency and commitment are important when it comes to financial discussions. Make it a habit to discuss financial plans regularly and revisit to make sure they are still reasonable. Respect the differences in opinions, styles and values when it comes to financial talks. A little understanding can go a long way toward improved and continuing conversations.